Just Look At These Fleeces! It’s the time of year when we are starting to get excited about shearing the sheep and combing the goats. Just take a look at the fleeces on these girls. The other day I pulled on a few of their coats and found staple lengths to average 7 inches. 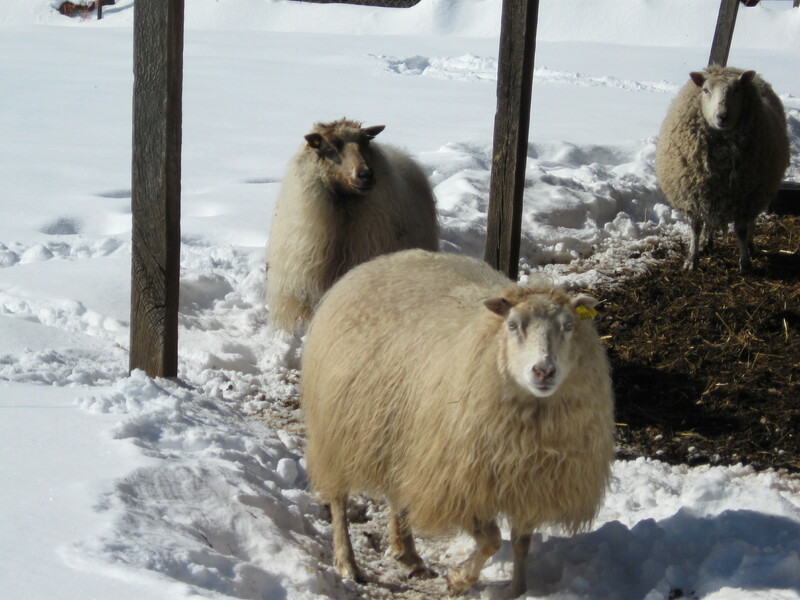 That actually included the 2 Icelandics that were shorn in November. We’ve decided this year to make a few changes in what the end products will be. Last year we tried our hand at a Fiber CSA, that did really well locally but not so great through the website. So, this year we are going to dump all fleece together and have it processed; 1/4 roving and 3/4 yarns. No doubt much of it will be dyed (since I’m “Jonesing” to dye!). What I should end up with is a blend of Sheep wool, Cashmere, Mohair and Alpaca. My business partner with the Alpaca’s figures we’ve got 148 fleeces this time. In the 15 + years that I have raised fiber producing animals, I have never done anything like this, so I’ve decided to start now making up samples. If any of you think you’d like to try a sample either of roving or yarn email me at breezehillfarm@verizon.net and when they are done I’ll send them out to you. This is my big entry for Fiber Arts Friday. Have a great weekend, until next Friday! We have several sheep that are a very light shade of gray and I love to over-dye gray wool, so I found a pattern for a shawl that I really liked (wish I could share the pattern with you but I can’t seem to find it!) and decided that I would do an honest to goodness “Sheep To Shawl” project. Armed with 3 pounds of fleece from our sheep Ivy, I set out to find the perfect color..ta da! It was Landscape’s Salmon. I dyed the entire fleece and I fell in love. The spinning process was rather lengthy because I only have time to work on my own projects when I’m not spinning for an ordered or making goats milk soaps and lotions. It took almost six months to finish spinning the yarn..once the singles were done, I had to ply all of it..another month! Finally, after setting the twist I was ready to start knitting. 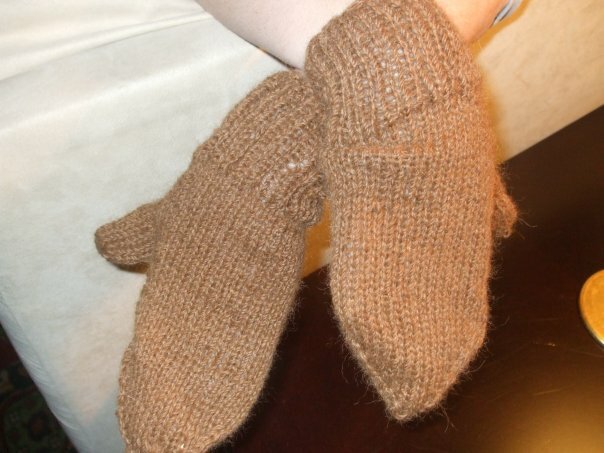 It took almost a month to complete the knitting process but I have to say, I am very pleased with the result. The next step was to add the fringe and these really cool hand painted wooden beads that I found at a vintage clothing store. Now that it’s done, I’ve decided that it really isn’t a personal project after all and have made it my feature garment of 2009 to sell as a Christmas gift and unveiled her at the Fall Festival last weekend. I had a couple of skeins of yarn left over, thinking that someone might want to make a hat or mitts to go with it. The first person that walked up to our table bought the yarn to use for a lacy border on a blanket she had just finished knitting. The shawl did not sell but it probably will before the end of the Holiday season. Here are a couple of photos that I’d like to share. Participating in Fiber Arts Friday..click on the link and join in. Cria Fleece Is No Good..I Don’t Think So! My post today for Fiber Arts Friday is somewhat boring and possibly a little educational. A few weeks ago, someone, somewhere mentioned on Twitter, I think, that rumor has it – cria fleece isn’t really good for much. At the time I responded that this simply isn’t true so I thought I would use my post today to elaborate. One could use the same statement for many “baby fibers”. For instance, Lambs Wool. Lambs wool is not the 1st years fleece from a lamb. It is the fiber growth from birth to the shearing done just before taking the lamb to market. That’s looking at about 4 months growth on the fiber. The fleeces are very small with short staple lengths and full of stress breaks from weaning, diet change and general growth of the lamb. Lambs wool is difficult to spin but it’s beautiful, soft and very much desirable. The first years fiber from a lamb is called a Hoggatt. This fleece is probably the longest, strongest, best fleece you will ever shear from that sheep in it’s life. A Cria fleece is much like lambs wool only in that it has a very short staple length. The cria fleece has it’s share of breaks in the fiber from diet and stress changes too. The fleeces are tiny but absolutely gorgeous (as any Alpaca or Llama breeder will agree). When you have one, you want to do all kinds of wonderful things with it but the fleece is hard to work with. Where mature Alpaca and Llama fiber tends to be more difficult to spin, because of the lack of memory, the cria fleece is multiple times worse. The staple length often resembles dust, but keep in mind, that is all cotton is and it’s spun into very strong yarns and thread. So, from this seasoned spinners perspective, I don’t find cria fleece to be undesirable to work with at all. I’ve heard many alpaca and llama breeders, through the years, say, “Cria fleece, oh yeah, we have it micron tested (why I’m not sure), judged and then we chuck it!”. I think of all of the wonderful things I’ve done with cria fleeces. I’ve spun them as is-makes awesome yarn for baby garments! I’ve blended it with a little bit of mohair and wool. I’ve even blended it with silk. It’s absolutely beautiful dyed and over dyed and added as fine strands to a stronger more mature fiber. If you raise Alpaca’s, and have fleece from one of your animals that’s not so great, cria fiber can be blended with it to soften up the yarns spun from that fleece. What is they say? “The possibilities are endless!” Don’t forget felting too. Tiny little fleeces can always be used in felting projects. I don’t want to step on any toes here but sometime people will tell you something is no good and it’s simply because they don’t have certain fibers readily available or they’ve had one bad experience. I am not a Master Spinner but I have been a dedicated spinner since 1994. I’ve spun rabbit, chinchilla, kid mohair, sheep, cotton, flax, soy, corn silk, dog and cat. Every fiber has it’s place. Me personally, I love the baby fleeces the best! There is no garment more beautiful than a baby blanket made with baby yarn. It may take 4 fleeces to complete it but the end result is to die for. Be sure to check out Fiber Arts Friday and join in!